More and more teenagers have been trying e-cigarettes in recent years. Now, a new study shows adolescents who use them are exposed to significant levels of chemicals that could potentially cause cancer. According to the study, published in the journal Pediatrics, teens who used e-cigarettes had as much as three times more of these toxic chemicals in their systems compared to teens who didn't vape. High levels were also found in teens who used both traditional and e-cigarettes. Several of the chemicals, known as volatile organic compounds or VOCs, are known carcinogens. 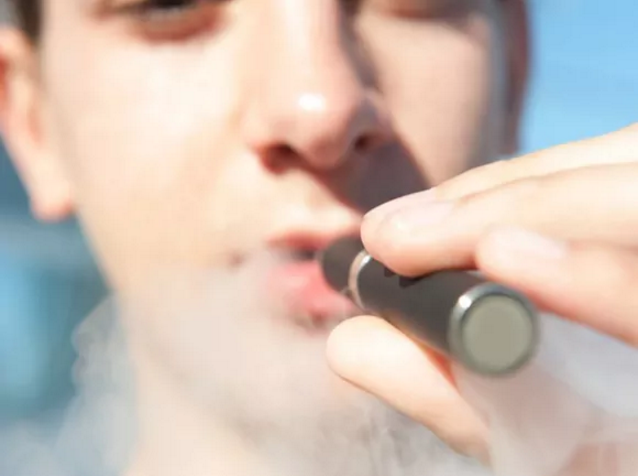 "Teenagers need to be warned that the vapor produced by e-cigarettes is not harmless water vapor, but actually contains some of the same toxic chemicals found in smoke from traditional cigarettes," lead author Mark L. Rubinstein, MD, a professor of pediatrics at the University of California, San Francisco, said in a statement. "Teenagers should be inhaling air, not products with toxins in them." For the study, researchers analyzed saliva and urine samples from a group of teens with an average age of 16. Sixty-seven used e-cigarettes only, while 17 used both e-cigarettes and traditional tobacco cigarettes. They were compared with a control group of 20 non-smoking teens. Dr. John Spangler of the Wake Forest Baptist Medical Center explained the dangers of some of the chemicals the study found. "Acrolein is so toxic that it is used in chemical weapons," he told CBS News. "Acrylonitrile is another chemical that's found in the study. If you breathe it in it will irritate your lungs. It also is possibly related to brain cancer and breast cancer." The study also found evidence of propylene oxide, acrylamide and crotonaldehyde. Some of the chemicals turned up even when teens used non-nicotine products like fruit flavored e-cigarettes. "E-cigarettes are marketed to adults who are trying to reduce or quit smoking as a safer alternative to cigarettes," said Rubinstein. "While they may be beneficial to adults as a form of harm reduction, kids should not be using them at all." Spangler also cautions the long-term effects of vaping are not known. "Electronic cigarettes generate nicotine in the vapor. And nicotine is a toxin to the growing, developing brain," he said. "These are not benign chemicals." The Tobacco Vapor Electronic Cigarette Association responded to the study citing a government report from January that found there's no available evidence e-cigarette use is associated with cancer.